Having your own residence is an incomparable feeling. Before start living, you always prefer to embellish the interior completely. And here, walls play a major part in giving an extra charm to the overall decoration. Blank wall always calls for something innovative and impressive. Even when you look out at the blank walls, you will find something missing; majorly from the decoration perspective. But not to worry anymore! We are offering you amazing ideas to add beauty to your walls without affecting their strength and durability. The things that you will require are few additional supplements that can be added to the walls to intensify its overall beauty. 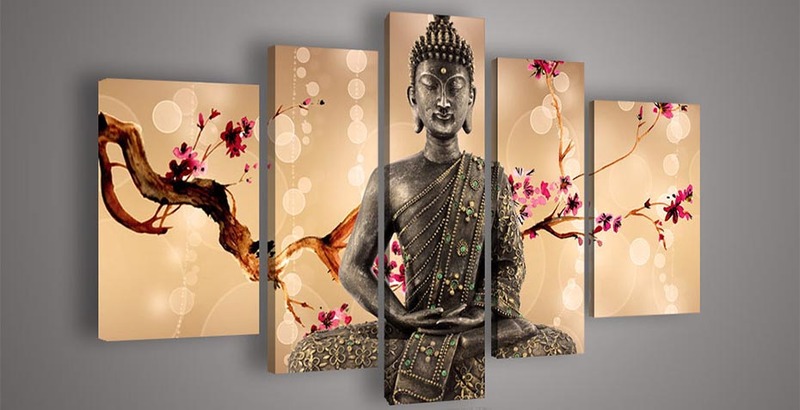 HANG CANVAS PAINTINGS: The traditional style, we all used to execute on our walls is hanging paintings of different sizes. The canvas may either have your family picture or any scenery. Actually, the reason behind hanging such masterpieces is that it becomes an eye candy when looked over the wall. You can either pin small sized paintings or just cover it with a large painting. ADD CORNER TABLE: You have already managed to collect a good home furnishing products, but still the corners are vacant. For that you can occupy that place by adding a perfect table piece. There are different versions of table linen that you can purchase to protect the table from unwanted damages as well as cover the walls. HANG A COLORFUL PLATE GROUP: Running with the ongoing trends, you can also occupy your walls with colorful plates. They can be hung in any shape and format you like them to show. But keep in mind to display the most decorative plate in the center of whole pattern. MAKE CENTER ORIENTED BED: By adding unnecessary stuff to your wall will definitely represent a junk feeling. It’s good to keep the wall simple and light instead of filling the whole with scrappy materials. There is another option for this. If it’s your bedroom, then make your bedroom center oriented, relying its headrest touching the center of one of the walls. A remarkable part will be occupied by the headrest and later you can pin a small (not large) picture over that wall. COLORFUL WALL IS THE BASE OF ALL: The current trend is of colorful walls. So, you must go for different color options and fill your walls with a color of your choice. Prefer to go for light colors, as it will multiply the lighting. Also, it will offer an appealing outlook to the blank walls. DO YOU FORGET YOUR CURTAINS? Windows are a special part which is beneficial for the inlet of light within your home. The windows too require to be covered properly. Instead of only covering the window panels, it also enhances the wall beauty. Choose a curtains set which matches your wall as well as other furnishing products within the premises. Fir this, you can either buy curtains online or reach any local vendor to offer you your requirements. So, what are you up to? Are you still searching for an idea and develop a workable strategy for wall decoration. Choose anyone from the above mentioned options and experience an alluring and energetic surround.